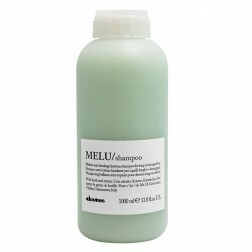 Davines’ Melu: The Secret To Protecting Long Hair. When hair breaks, it can be frustrating to say the least. Davines Melu lineof beauty products offer the best in natural hair care to nourish and protect and restore any long hair, from shoulder length to waist length. 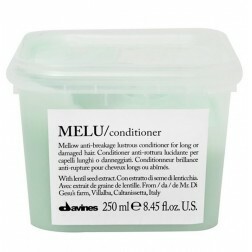 From dry, over treated long hair, to brittle or frizzy long hair, Davines Melu comes to the rescue. These melu shampoos, conditioners, repairing serums and thermal protective shields use naturally derived ingredients to deliver the most powerful hair restoring treatment that you can get – inside or out of a salon. One of the most common problems involving long hair is constant breakage. Davines Melu products have the solution, with cutting edge hair care that incorporates the best of traditional herbal recipes with the most promising science yet discovered. Hair as short as shoulder length hair can become susceptible to breakage, whether it’s colored, dried, or over treated, or even it’s not. 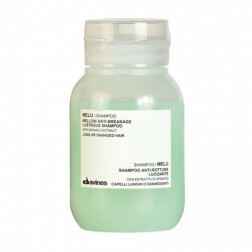 Your first line of attack: Davines Essential Hair Care. 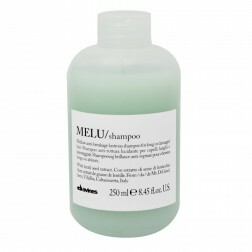 Their fine Melu Shampoo features an anti-breakage formula and gentle, natural ingredients like Spinach Extract, antioxidants from Vitamin A and C, and elements from coconut oil that protect your hair and restore its natural protein balance while cleaning it. 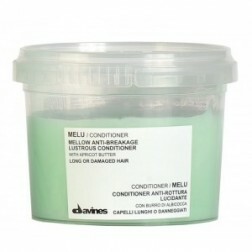 Follow up with Davines Melu Anti Breakage Lustrous Conditioner. It’s made to protect and restore long hair, while gently adding back nature’s goodness (and reducing your hair’s static properties). This conditioner features apricot butter, and vitamin A and C.
It would be appropriate to mention that proper use of a comb and brush is essential to maintaining and protecting your long, fragile hair, and particularly for reducing split ends.Melu Split Ends Sealing Repairing Serum is designed to help with this goal, with its nourishing moisturizing Cherry Oil and Keratin, as well as Vitamin E. Use on wet hair before drying, or on dry hair before you style it. Finally, the Melu thermal protective shield is rich in essential oils, features Rosemary extract and antioxidants, and generally is good for hair that will be subjected to the heat of blow dryers and curling irons. Use before styling, but after using Melu Shampoo and Conditioner. Each of these Davines beauty products are created using the latest scientific research combined with the most trusted traditional recipes, to give your hair that looks and feels its best. The Fashion and Beauty Store carries all of the products you need at the low prices you will appreciate. Visit often to check out our coupon deals on product prices and shipping.